A three-month investigation shows that some of the most outspoken campaigners who demand that consumers pay the colossal price of shifting to renewable energy are also getting rich from their efforts…. I am saddened by this negative article, which has nothing to do with Catholicism. An English Sunday newspaper is not the best source for accurate information. Should CL split in two carrying articles about Catholicism in one part and a second section, for those who want it, about the political and economic views of some involved with it? I must admit, I wonder from time to time whether I’m on the right track. Your occasional missives assure me that I am, indeed, going in the right direction. That there might be something that has nothing to do with Catholicism is a peculiar notion; I haven’t come across the idea in, for instance, the New Testament, or the documents of Vatican II, or the Catechism of the Catholic Church. And, though I can’t say that I’ve tried very hard, I haven’t been able to constrain my own mind by such a narrow vision. Politics? The so-called Energy Independence and Security Act of 2007, whence the restrictions on certain light bulbs that effectively ban their production in the USA, was bi-partisan Congressional legislation signed into law by a Republican president. There are poor people and there are phoney environmentalists but there is no such thing as poor environmentalists. If I chained myself to a tree for a day, I would be late paying my bills, by a day. Not so with the wicked, not so, says the psalmist. They got da dough. Noelfitz, stop being a schismatic. You can start your own website. Not sure how? Consult the Obama website experts and watch it take off. Do you know how to rap or balance yourself on beer kegs? 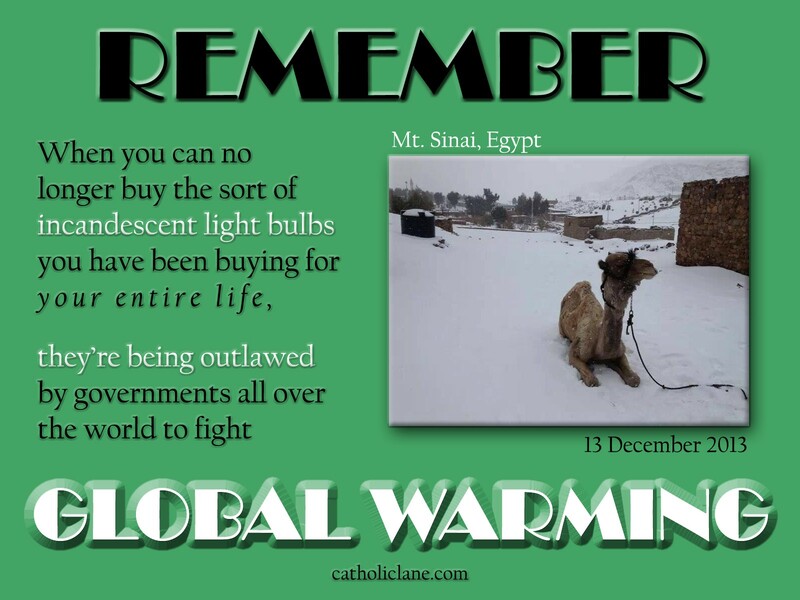 Is the argument here, “There’s snow in Cairo, ergo there is no global warming”? If that’s the argument, it is extremely ignorant, on any number of grounds. In the first place, weather is not climate. In the second, weather is a dynamic system, and in a dynamic system, a rise in the mean is accompanied by a rise in the extremes. That is to say, as mean temperatures rise, you see also hotter hots and colder colds. And more rapid changes between the two. How did this get published here? I think the point here is “follow the money”. Actually, that was an afterthought. Literally, as in I discovered the link after I posted the image. I like to think of my images, at least most of them, as graphic haiku. One or two observations; one or two images. Some connection between them, perhaps not obvious. To provoke an “aha” moment, which may not come at all for some, and which may come in different ways for others. I am very grateful to you for your thoughtful, respectful and detailed reply to my post. good faith and to disagree is not a sign of disrespect. Some time ago a post of mine to CL was, I considered, attacked unfairly and I was held up to ridicule and contempt by a number of senior people in CL. I was accused of being narky and reading CL only to find posts I disagreed with. I was very hurt, but on reflection and with the encouragement of some very Christian posts I have not ceased all contact with CL. I congratulate CL and all involved for their commitment to Catholicism. Finally ma y I reiterate: thanks, congratulations and keep up your good Catholic ministry. reply? Is it best to ignore “ad hominem” insults? In our Catholic faith I am encouraged to treat my enemies with respect and love. So a reply to you defending my beliefs may not be be appropriate. spreading of the kingdom? Does it harm the unity of the Church? whether I am welcome here or not. Noel, we have no idea why you want to be here, since so much of the content here irritates you to the point that you often complain about it being published on here at all. I even suggested that you simply not read articles posted under politics since you don’t like them and usually object that they shouldn’t be here, but that suggestion was ignored. No one really knows what to do with you nor do we have the endless amounts of time you seem to have. You lack the sense of humor and proportion just as every other lefty. unchallenged on a right-minded website then you’re as arrogantly “naive” as your hero sitting in his cushy chair, peddling Obamacare. My apologies for any hurt feelings. I can’t wrap either and I need to do that. beer keg. All bet’s are off when it’s empty. I know it goes both directions. It may go in both directions, dear Editor, but we have no reliable information that it is in fact the case. What Medaille cites is junk journalism promoting junk science. Let’s have an open and honest debate. Let’s not mandate fees and taxes on something that may in fact be a communist movement under another name. The article says that “conservatives” are funding a pushback on the climate change issue. This is meant to discredit conservatives so that Algore and other self proclaimed experts can levy more taxes. This is nothing but Obamacare for the environment. Even junk scientists are not calling it global warming anymore. That term is not working for them.The big business money mounting a pushback is doing us a favor, using their own money. They want the issue examined scientifically not politically. The only ones against that are those who are taking our money and subsidizing political cronies in the solar and other pipe dream industries. The only thing I see working both ways are the lobbyists and proponents flying in to Washington and Oslo and Brussels using jet fuel and plastic containers and congregating in fine surroundings served by low paid labor that is additionally taxed to recycle their garbage. “Should newspapers ban climate deniers like Reddit’s science forum? Here’s a topic for discussion on The Guardian’s website. Democracy and the free exchange of ideas at work by lib’s standards. There may be ten percent of truth to the story linked in the Guardian…..
let’s say it’s all true, my contention is that they are doing it with their own money and they are accountable to someone. The gov’t uses my money for junk science and is accountable to no one. You’ve dipped your hand, John Medaille. I will now be reading your articles on distributionism with some suspicion. See I’m different than most here. I have no problem believing the Earth is warming, and that humans contribute to it. I just don’t like the magesterial certainty some proclaim about how much warming is or isn’t occurring. The science on that part really is overwhelming, as scientific as our belief in the greenhouse effect. I’d also note it is the (Unofficial) position of Popes John Paul II, Benedict, and Francis. That doesn’t make it binding, but worth considering something. As with anything here on earth, there’s money to be made off of it, so you will see a lot of rich people doing bad things. Yet that doesn’t negate the reality of the whole situation. I’m a traditionalist, but one who also has a healthy respect for science. I have no problem believing the Earth is warming either, Kevin. I just don’t know what the rest of your statements mean.